Cuisinart is known for their high quality cooking appliances and their CEK-40 electric knife is no different. It's a high-performance knife with two stainless steel blades and an ergonomic handle for both right and left handed cooks. Many reviewers say the Cuisinart CEK-40 is a very good electric kitchen knife and performs well over several years. 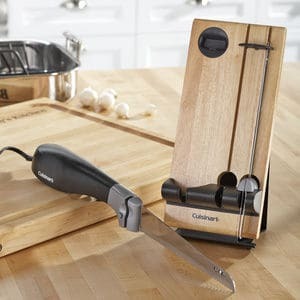 This set of the Cuisinart CEK-40 electric knife also includes a solid wood butcher block tray with a safety lock system. The knife set also comes with several removable blades for many applications. The electric knife blades included with the CEK-40 are both a bread knife blade and a carving knife blade included. The electric blades are 9 inches long, which should be able to handle most meats and breads. A big concern with electric knives is their durability. The Cuisinart CEK-40 electric knife succeeds in that and is a very durable knife and should last for many years. Be sure you don't force it though if it gets stuck on a bone or something hard, as this could strip the gears of the knife. Some people also felt that the CEK-40 stopped working as well after several years.